A close friend of mine and a close friend of my sister’s, whom I’ve also known for years, each lost a brother this summer, in both cases unexpectedly and at far too young an age. I have never met either of their brothers; they lived much further east in Canada, so these deaths feel strangely abstract except for their very present impact on my friends. It is hard to know what to say in the face of such loss, but not many words are needed since it is better to listen to someone who’s grieving rather than blab at them. 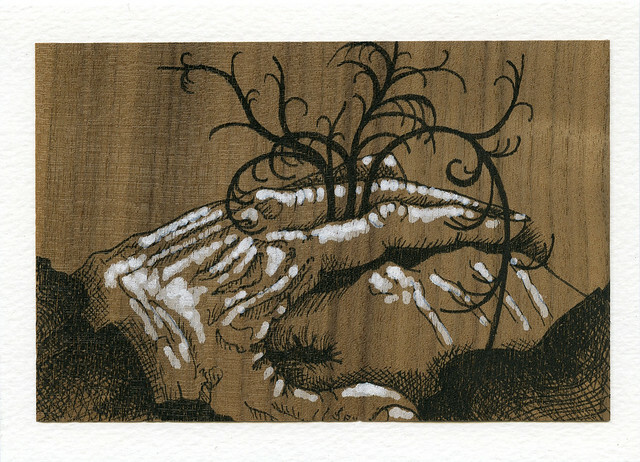 I am sending them each a hand-drawn card on wood veneer.